Organize your email lists and marketing tasks in one place! Many people use LACRM to track their sales and manage their sales teams, but what about marketing? Marketing and sales frequently go hand in hand, and it can be helpful to have both areas of your business in one place. Whether you’ve got an entire marketing team or you’re a one-man show, these tips will show you how LACRM can help with your marketing initiatives. 1. Ensure high data quality with a data entry plan. First things first: you want to make sure that everyone you communicate with (PR contacts, your email list, current customers, and leads) are in your CRM account. Gather your contacts (from various marketing programs, spreadsheets, and even your email contacts), and import them into Less Annoying CRM. You can add contacts to various groups as you go (we'll talk more about groups later in this post, too). Then, you'll want to deduplicate your records to ensure that you only have one contact record per person. By keeping all of your marketing contacts in one place, you no longer have to update multiple systems when a contact's info (or interests) change. And if your data is accurate and rich, you'll be able to send better, more targeted marketing communications to your contacts. Note: Before you start importing large lists of contacts into your account, you may want to talk to your CRM Coach to come up with a plan. They can help you create the groups that you'll need to segment your contacts, as well as run your imports for you! By creating groups, you can easily pull up lists of contacts to target with each of your marketing campaigns. You can segment your contacts into groups based on interest, location, products purchased, and more. You can create your groups under the Manage Groups page under Settings, and tag your contacts in different groups both in bulk or individually. You can create, rename, and share groups from your Manage Groups page under Settings. As you add new contacts to the CRM, you’ll want to add them into the correct groups. If you introduce a new product or want to push out a discount for existing customers, you can easily pull up a group of interested folks and send them a targeted message. You can export your groups to run a mail merge with physical mailing materials, or read on to learn how to send your group an email blast. You may also want to group your PR and other network contacts. For example, if you regularly send press releases to bloggers and news sites, you'll want to have groups for these kinds of contacts so that you can easily identify and export them. 3. Use MailChimp to send email blasts to your groups. MailChimp is an email marketing program built for small businesses. Less Annoying CRM integrates with MailChimp, and they have a free tier that you can use to get started with email marketing. This tutorial will show you how to sync up your groups in LACRM with your lists in MailChimp. You'll want to sync up one group per list. If you don't want MailChimp unsubscribes affecting group membership, you'll want to duplicate your groups. Once you have your groups synced with MailChimp, you can send them targeted email blasts! Not sure what to send them? Check out our webinar on email marketing for ideas on building your strategy (and then follow up with these blog posts). Need to send a similar email to multiple groups? Check out this tutorial for a how-to on replicating campaigns. 4. Track how your leads are coming to you so that you can see which marketing channels are converting. Now that you have leads coming in from your various marketing campaigns and channels, you can track which marketing methods are converting the most customers. 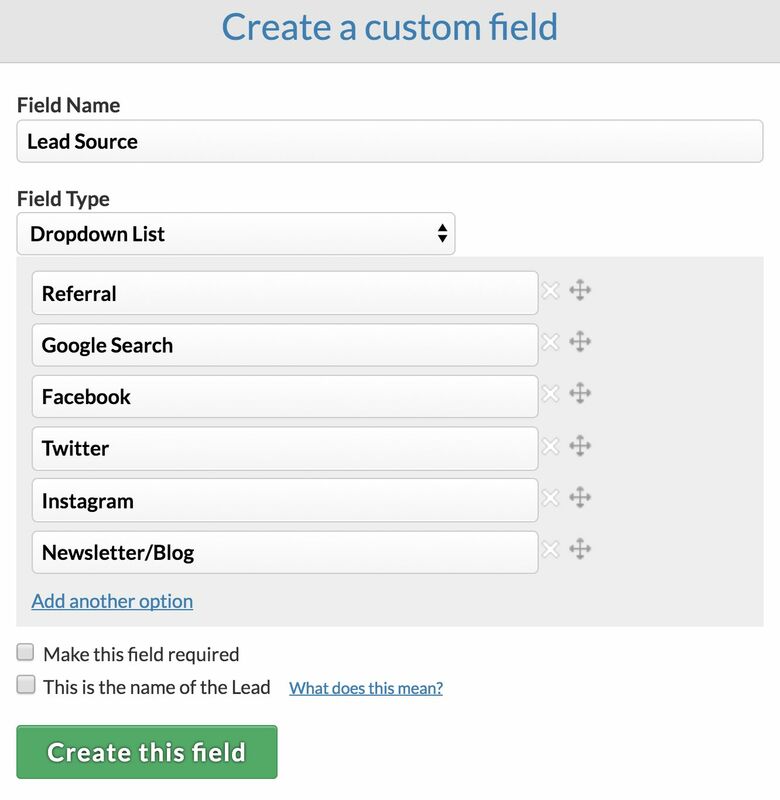 In your Leads pipeline, you can create a custom field for Lead Source to track where all of your leads are coming from. You’ll want to include your various marketing channels as options. You can customize your pipelines from the Customize Your Pipelines page under Settings. At the end of each month, you can pull reports to see the total number of leads that came in through a particular source and see how many of them converted. This can give you an idea of your conversion rate for each channel and show you where you should be focusing your marketing efforts. 5. Use your pipelines to track different marketing initiatives. If you’ve considered starting a totally new marketing program, pipelines can help you track your progress and effectiveness. Here are a few different marketing initiatives that you can try that pipelines can help with. Referral Program: Track your referral program in LACRM using our relationships tool, or you can even create a pipeline specifically to help you process referrals. Loyalty Program: The CRM can help you group and track contacts in your loyalty program, and the system will even remind you of important dates like customer birthdays! Customer Feedback/Interviews: If you want to start gathering feedback from your customers, the CRM can help you track your progress and store all of your notes and insights. Marketing Expenses: Do you need to report your marketing spend? Use our Expenses pipeline template to track what expenses you've reported, if you need to be reimbursed, and if the expense didn't qualify for reimbursement. 6. Keep your team on the same page. If you have a team, you'll want to chat with them about your CRM setup. Everyone who talks to contacts should have a login for the CRM so that they can update necessary info. You should explain your email list groupings and show your teammates how to subscribe or unsubscribe contacts by adding or removing them from a group. You'll also want to explain what pipeline custom fields they need to fill out when processing new leads (and consider making these fields required). If everyone on your team is entering and maintaining data in the same way, you'll all be on the same page -- instead of keeping separate silos of information. Need help explaining the CRM to the rest of your team? Don't hesitate to contact your CRM Coach! Your CRM Coach can learn what you want to present to your team, set up a screen share, and even record the call for future training. 7. Schedule your content and posts using the calendar. Create a “Marketing” subcalendar to plan out all of your blog posts and marketing-related tasks in advance. You can create an all-day event when a piece of content will be published that day, or if you’re pushing out more than one post a day, you can schedule them in the calendar. You can make sure you have a new post to publish every week, and keep track of what content will be available at a given time. You can create multiple subcalendars for marketing -- in my LACRM account, I have a subcalendar for general marketing tasks, another for publishing dates, and another specifically for Less Annoying's User Conference. You can also carve out marketing time in your regular schedule using LACRM’s events and tasks. Schedule events for content writing time and create tasks as reminders to check in on social media stats. If you have a marketing person on your team, have them use the calendar so that you can get an idea of what they are doing each day. Don't have a ton of time for marketing-related tasks (or a ton of cash to spend on fancy marketing tools)? Check out this post for tips and tricks on how to efficiently market your small business for $0. 8. Pay attention to company feedback. This may seem like a no-brainer, but good marketing requires listening to your customers. What drew them to your company? How do they talk about your company when they make referrals? What makes your company stand out from the rest? If you know the answer to these questions, you can craft spot-on marketing campaigns with language that really resonates. Having a CRM with all of your data in one place makes identifying common phrases, compliments, and complaints about your company easier. You can start tracking your feedback in the CRM (like we recommend in tip #5), and make sure you respond to everyone who fills out your feedback form. Or, you can frequently review activity reports to see what language your customers are using in notes and logged emails. Want more marketing insights? Sign up for our newsletter below to stay up to date on our latest articles and webinars! This post was originally published on 01/29/2018, but was updated on 01/23/19.